Hit the jump for full written review & scores. Traction – As with most translucent soled sneakers, these worked for a brief period but then the dust quickly became an obstacle that couldn’t be overcome… doesn’t leave me with much hope for the Air Jordan XI. Front to back they were decent at best but players often need stable traction for every direction other than front to back… especially if you are a Guard running around. If the shoe offered more flex or range of motion then maybe things would have been different but as they are… it just wasn’t ideal for indoor courts unless they are kept perfectly clean. Outdoors may prove useful if the court has a bit of texture to it… but I wouldn’t dare play in these on a smooth outdoor surface. Cushion – Once the shoe is broken-in – I’ll get into that in a bit – then the cushion begins to soften up. Its strange having a shoe that features full length Zoom – double stacked in the heel – start out so firm. I will say that once things begin to soften up then you can appreciate how comfortable a Foamposite can be… it just takes a hell of a lot longer than you’d imagine. Material – I have a love hate relationship with the materials. 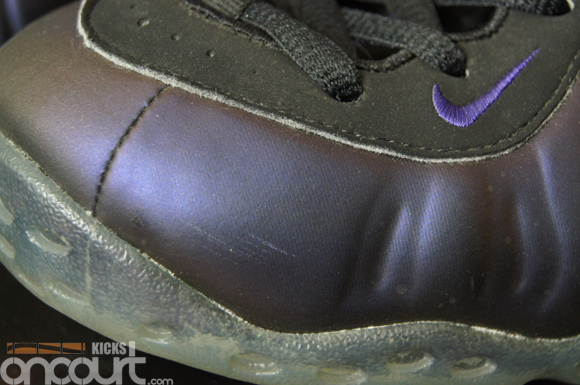 The foams sturdiness and protective traits are awesome… you just can’t enjoy them for a while until it’s all broken-in. 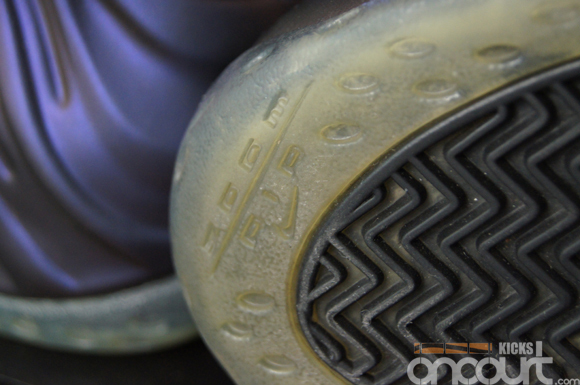 One thing that is apparent in a shoe featuring Foamposite… it’ll last… the materials will actually outlive the glue holding everything together. Fit – Break-in time… lots of it. Be prepared for one of the most grueling break-ins you’ll ever experience. I’m not even joking either, I knew I was up for a challenge with this one but I honestly had no idea it would ever take as long as it did. Even after switching to a pair I thought was already broken-in taught me that Foamposite’s will always need to be broken-in again and again when playing in them. After you are done perspiring inside the shoe the shell hardens up a little, contouring to your foot shape but leaving you with a stiff shoe until you warm it up again… it’s like playing with a tight muscle, it constantly needs work which is a little too much maintenance than I can a handle. Its overall fit is great after it molds to your foot with the exception of the heel… that area needs a lot of work and I couldn’t do anything to keep my heel locked into place. Thanks to the sloppy heel lockdown, it ends up feeling like you have a brick flopping around… like a really heavy sandal or clog. This is probably the shoes Achilles heel… pun moderately intended. If there were better heel lockdown available then the shoe would have played a little smoother and less clunky, even for its weight. These are the same weight as the Air Jordan VIII and you wouldn’t ever know they weighed the same unless you threw them both on the scale… even then I thought my scale was broken because they just feel like dead weight in comparison. Ventilation – There is only minor ventilation which is featured along the tongue. 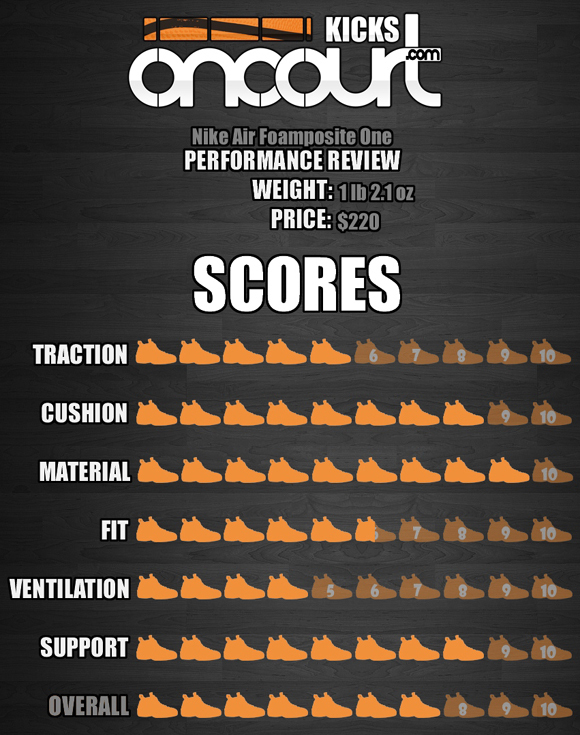 This is necessary for the materials used so the rating shouldn’t be considered here… unless you absolutely need a shoe that can breathe. 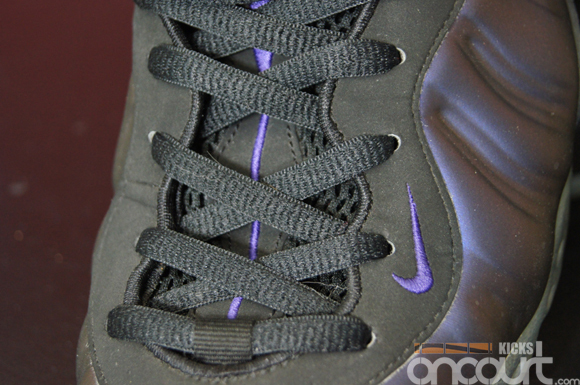 Support – Carbon Fiber, Foamposite and a double last midsole… that’s a lot of support. It would have been better had the heel fit properly but we can’t have everything we want now can we. Overall – This is not my cup of tea… I know a lot of ball players love to play in Foams but I think I’m much too small for them. If there was ever a shoe made for LeBron James… it was the Foamposite… His Foamposite based sneaker looked much better than this one though – from a performance perspective. Besides the heel lockdown I would have preferred the shoe to not feature a double last midsole. This made the shoe nearly impossible to flex with your foot the way a quick Guard would prefer. Front to back was fine but I’d have liked some lateral flex so I could maneuver the way I usually do. Not a bad shoe but not a great shoe either. It’s definitely cool though… I’ll give it that. What’s the Foamposite-based Lebron sneaker that you mentioned at the end? I google’d it quickly and only found some Lebron 9’s with foam added and a custom version of this shoe made for him. if you had to choose a foamposite based shoe which one would it be, cuz i would pick the flightposite. I vote Flightposite 1 or 2. Mine would be flightposite 2. Much more flex in the forefoot since the foam is only in the rear. 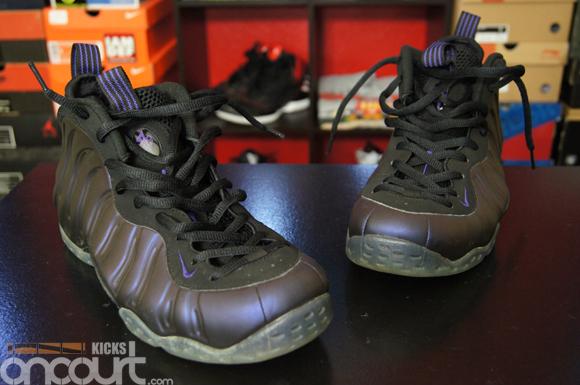 Plus the foam isnt anywhere near as hard as it is in the foamposite one/ pro & flightposite 1. Given what you said about the foamposites, would the flightposite 1 & 2 be less durable, but also require less of a break in period as compared to the foamposite ones? The Flightposite 2 probably but the Flightposite 1 is built almost the same as the Foams. Another great review. I was really curious on how foams would perform for a guard that I think plays similar to me when I was a lot younger. lol. I want to take the Air Penny 3, but I do not know their strengths and weaknesses. When there will be a review on them? From cushioning standpoint, heel and forefoot zoom is the better option. If the full length zoom bag has the same thickness as the separated bags, it would be too mushy and unstable. But I do like the smooth transition and responsiveness full length zoom give. And I love the full length zoom + IPS combination in Air Jordan 23. I never found full length zoom to be unstable since it was always embedded within the midsole… you can only sink so far into the shoe based on the bags overall thickness which still isnt ‘thick’ all things considered. The XX3 doesnt have true IPS unfortunately… they just have rubber pods that stick out from the outsole which gives the feeling of more cushion without really adding anything to the shoe. 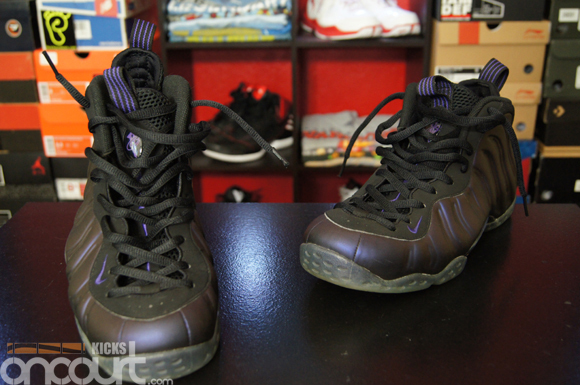 Do the foamposite one run true to size?? sorry for the double post. just wanted to get this answered. in your review of the kd4, you rated the cushioning as a 5/10, but mentioned that it can be enhanced via nike id. so if you were to have the midsole softer, what rating would you have given it? would it have affected that performance aspect of the shoe? 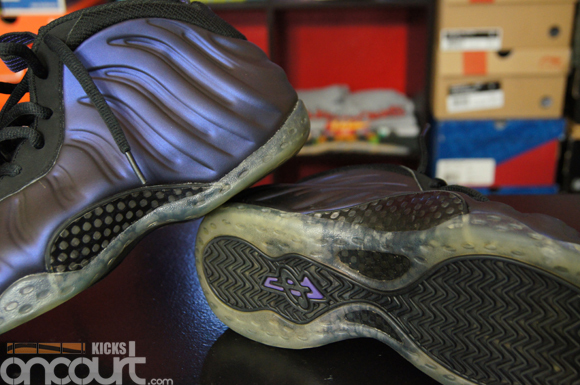 are the foam pros any different? are you going to do a review of those or are they basically the same performance wise? Finally got around to shooting around in mine at the gym….omg this will be a test of my will to play in these things. I’ll just remember, there is a light at the end of the break-in, I mean tunnel. Do the foamposite one run true to size? hey Chris, do the side carbon fiber breaks easily? after lacing them up for about 15 mins, i can really feel the carbon fiber on the lateral side press against my feet, so will they break/crack easily? How exactly do you mean most grueling break-in time? can an ankle brace help solve the heel fit issue? not not only for foams, any other shoe for that matter?